The F-4EJ was a version of the famous McDonnell Douglas F-4E developed for the Nihon Koku Jieitai (Japanese Air Self Defense Force, or JASDF). The order came end 1968 and with some aircraft first build in the USA bij McDonnell, the first Japanese assembled and build Mitsubishi plane flew in May 1972. A total of 140 planes were delivered with the final plane coming of the assembly line May 1981. Also some additional RF/4EJ reconn planes were build which were unarmed. The F-4EJ was developed for the air defense role only with several systems of the F-4E not being installed. The F-4EJ has common with the F-4E the Westinghouse AN/APQ-120 radar fire control system, the 20-mm M61A1 cannon with 640 rounds, plus AIM-7 and AIM-9 air-to-air missile capability as it has the air defence role. It however also got some Japanese internal systems and externally. The F-4EJ first entered service with the JASDF in August of 1972. In the JASDF, six interceptor squadrons (hikotai) have operated the F-4EJ. These were the 301st, 302nd, 303rd, 304th, 305th, and 306th. The RF-4EJ was operated by the 501st Hikotai. During the service life some updates and modifications were made, like the refuelling receptacle and ability to carry conventional bombs. 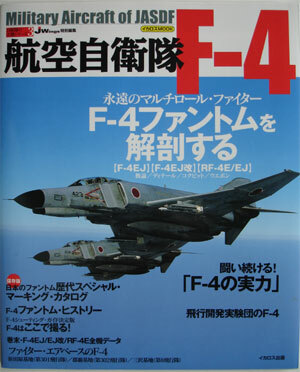 Since the mid 1980?s a `Kai` update program was started, updating the various F-4EJ planes of the JASDF. The Kai has another radarnose and different cockpit panel layout. Wing leading edge devices are by aerodynamicists called leading edge flaps when they only can be tilted downwards. They are called a "slat" where there is a noticeable gap between the device and the wing that helps the airflow to create more wing lift. There are also extendable slats that also move forward significantly, creating an even bigger lift (at however the cost of a more complex and heavier system). These were also used on some F-4 variants and can be recognized as they have actuator/hinge fairings on the lower wing surfaces at the leading edge. The F-4EJ differed from the USAF F-4E in having no inboard movable leading edge device on the wings. Looking at the pictures above taken around 1984 and you will see the F-4EJ is equipped with a leading edge flap both on the mid-wing and wing tip with no actuator fairings below the wing. It has thus NOT the later style F-4E leading edge slats. Normally these devices are in the clean neutral position (so not deployed) on the ground. (also noticeable are the plain trailing edge flap and outboard aileron). Also, sometimes a "slot" is mentioned. This is in fact in case of the leading edge, a situation of a slat that can NOT move and is in fixed position. On the F-4, horizontal stabilizers could be seen both with or without such a stabilizer slot; the device is fixed "inverted" in order to guide the air flow at extreme angles of attack and are more aerodynamically effective. The F-4EJ are mostly seen with horizontal stabilizers that DO have the inverted leading edge fixed slot. (probably at first delivery, they had non-slotted stabilizers, new slotted ones being refitted later during the F-4EJ service careers). This basically means that the Tamiya F-4EJ wing of the kit is correct but I suggest o just fill the inscribed inboard flap panellines. To show more clearly the mid-wing leading edge flap, a small saw cut can also made. 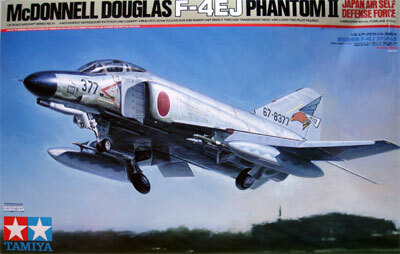 This model building report will cover in 1/32 the normal F-4EJ as used by the JASDF say around 1990. 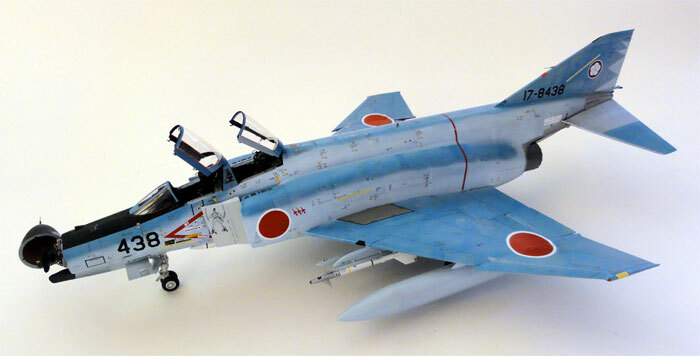 The Tamiya kit from Japan of the Phantom as used by the Japan Air Self Defense Force (JSADF) F-4EJ is an excellent kit in 1/32 scale. 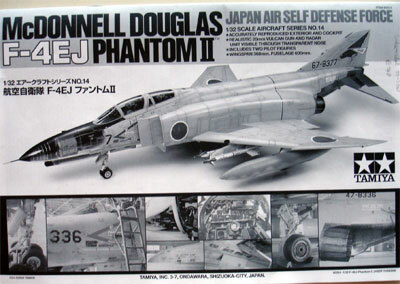 Tamiya issued quite a number of F-4 kits, with a F-4C/D appearing in 1995 and this F-4EJ kit (#60314) issued in 2004. 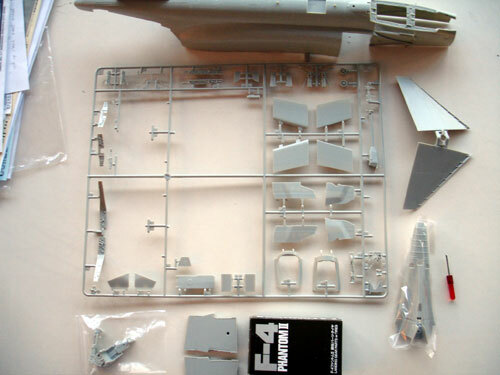 Here you get an idea of the F-4EJ kit parts, some of them already removed from their sprues and sub-assemblies made. The kit has about 400 parts, but you don't need all. You get metal screws which are used to get some extra strength into the model and a screwscriber. Also, cast metal undercarriage legs are provided with rubber tyres. A couple of good pilot figures are also in the kit. 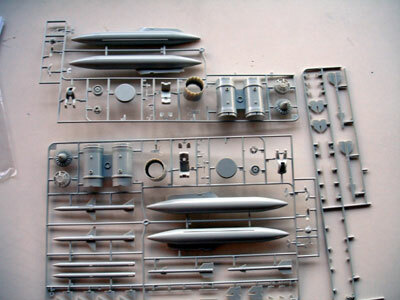 Details include a radar and Vulcan cannon that are to be assembled and can be shown through a "transparant" nose : you a grey and transparant "M" sprue. (more on the nose later on...). 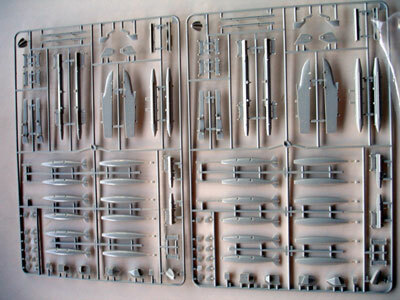 Sprues with air-ground weapons, most of them not used for the F-4EJ. 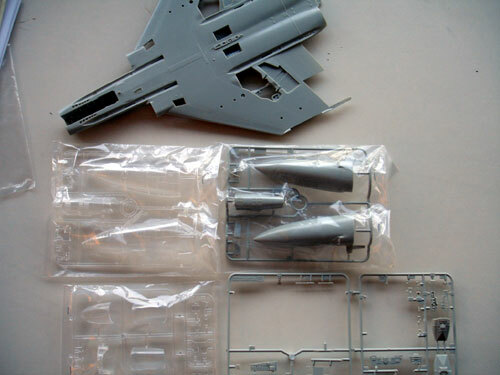 (many of the stores are for the F-4C/D kit). You also get af better Sidewinder AIM-9L missiles (the old ones can still be found on the sprues but are highly inaccurate!). 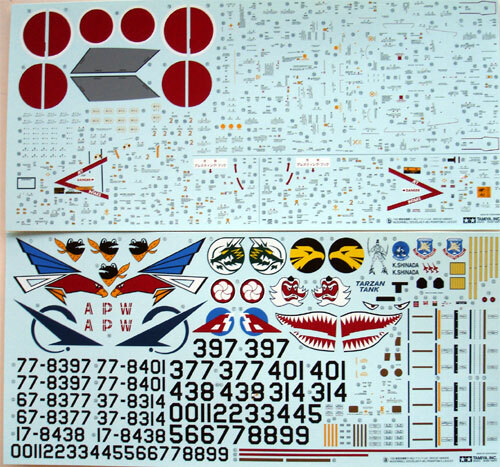 Excellent decals provided in the F-4EJ kit for JASDF planes, including all stencilling!! Markings for 10 planes representing all 6 JASDF squadrons are present, but none of these schemes are very spectacular. 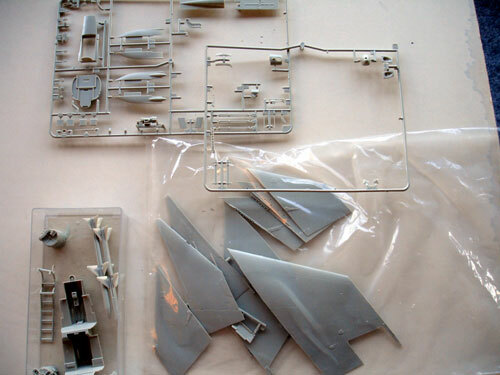 (I will attempt to finish the model in a very colourful scheme in which many JASDF planes are finished). McDonnell Douglas Aircraft Since 1920: Volume II, Rene J. Francillon, Naval Institute Press, 1990.